Wisely, I allowed extra time to get to the airport and extra time to BE at the airport. UN-wisely, I also decided to wash his infant car seat lining at the last minute. Initially, I was so proud of how brand new it looked, fresh from the washing machine after 18 months of hard wear and much travel, I was soon deflated by how I hadn’t anticipated the “fit” of my now 30 pound and 33 inch long baby! I got the sparkling clean lining in just in time to get the text from Dial 7 Car Service that they were downstairs, then…UH OH (as my toddler is fond of saying all day, every day no matter “what-oh) it was too snug! Driver texting from the street, suitcases and all 3 cats in the hall - either wishing they were coming - OR - happily saying bon voyage to this alien that took over their space a year and a half ago! I had to move quickly and find a way to extend the straps! But then there was the usual NYC rush hour traffic with bad weather to boot. Cool. We were still early (enough). Got checked in and rushed through security with my gregarious baby boy who clearly felt it was important that everyone at their post be acknowledged with a proper, personal wave and a verbal, "Hi!" All good, ‘til your flight is boarding and the gate is a mile away and your baby won’t go back into the stroller that just cleared security AND is in need of a massive diaper change, which in fairness to all soon-to-be fellow neighbors and travelers, kind of needs to happen NOW. Oops, sorry no time. We board, we swap seats several times until the right combination allows Aidan and I to sit with Jon Diamond (my music partner, for those of you who are new to the party, aka “Uncoo Jon"). Perfect. Good thing about boarding late is less time ‘til take off, right? 30 min to go ‘til airborne and Aidan can have his toddler meal (another blog entirely - uh oh) and be fast asleep. 2.5 hours later we find out we are still number 26 for take-off. Yet still, cell phones and bathroom privileges are not permitted. Baby scarfs in a volcanic mess that no one but me and “Uncoo Jon” will see. Mama hot walks a bucking, Sea Biscuit like baby (holding the back neck part of his onesie with a fine balance of light and firm) as he runs up and down the aisle. Up and down. Up and down. Up and down. For however long it takes for my back to finally start aching and a flight attendant to tell me sternly, “Enough!” I laugh to myself, thinking of our silent 60+ minute run that disturbed no one - but this flight attendant who now wants me to strap this wild pony down when there are so many more things to see! 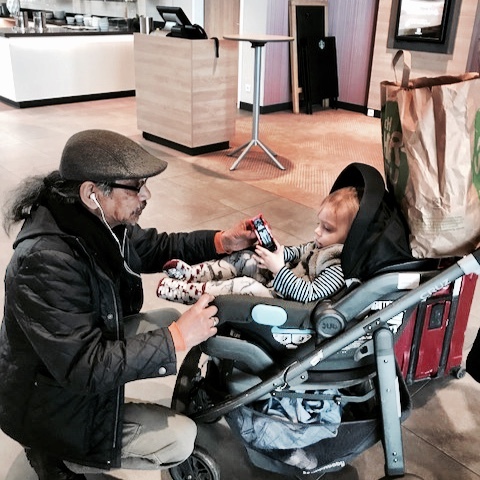 I’m almost tempted to acquiesce to her stern demand just to show her how misguided it is, but I have too much consideration for my fellow travelers so I just “dance my baby down” before he ever notices that we’ve been tethered. As he starts to struggle and squirm I know he thinks he wants anything but sleep - but I stand by the old “hate me now, love me later” motto and press him tightly against me as I sing our song. The song I’ve sung to him since he was born. 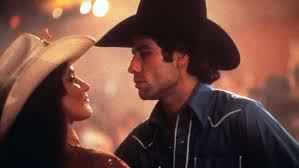 A corny but beautiful Ann Murray song from the 1980 film, Urban Cowboy starring John Travolta and Debra Winger. Could I have this dance…. And yes, I cry pretty much every time I dance my baby down to this. We arrived safely and thank the lord McDonald’s has veggie burgers and Greek salads after a 3-hour drive took 6 hours and we arrived in no man's land for food. To end the evening, Aidan and I had an after-dinner, midnight stroll through the deserted town. "I changed the name of this town." Oh and just to let you know a little bit about the new show…we will have the horn section on pretty much all of the April/May shows to give this Memphis soul album, Love Lives On, the justice I think it deserves! Hope Y’all agree!